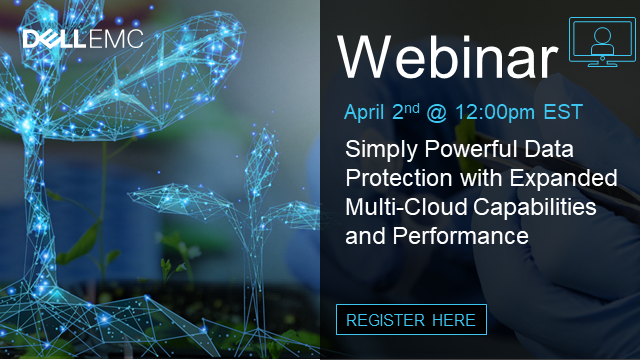 Join us on April 2 at 12:00 EST, to learn about Dell EMC’s latest innovations to our simply powerful data protection appliances. Dell EMC remains the unquestionable leader in data protection appliances with close to 60 percent market share[i] because we continue focusing on our customers and their unique needs. Our relentless emphasis on continued innovation is why customers see Dell EMC as a partner, rather than just a vendor, and stay with us for the long-term. Dell EMC appliances deliver powerful data protection that scales as customers’ data grows, and provides the flexibility that our customers need as they transform their IT environment and increasingly move to the cloud. On April 2, we will be hosting a webinar that will speak to the recent enhancements to performance, scalability and cloud extensibility that have been introduced to both Dell EMC Data Domain, and the Integrated Data Protection Appliance (IDPA). We are looking forward to seeing you on April 2. Registration for the webinar is now live. To learn more about Dell EMC Data Protection Appliances, check out the Dell EMC Data Domain home page, Dell EMC IDPA homepage, read Data Protection blogs, and follow @DellEMCProtect on Twitter for our latest announcements and content.